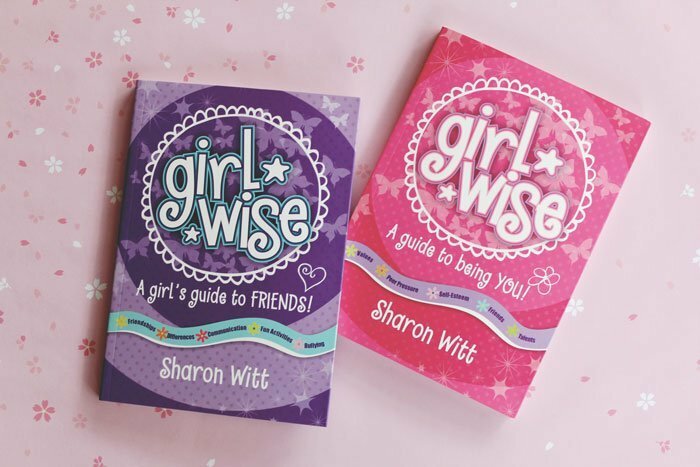 This week at tiny & little we’re loving the series of Girl Wise books by Sharon Witt. These inspiring books for the tween girl focus on important qualities like self esteem, values and friendship, while also offering tactics for the difficult moments that come with growing up like peer pressure and bullying. One of the best things about these books is that they aren’t written for the parents of tween girls – although mamas could sometimes do with the positive self-talk ideas when we’re having a down day – but they’re written for the girls themselves. The reason that I adore that approach so much is because I think it’s incredibly important to feel good about yourself and your worth, and these books inspire girls to feel that within themselves. Sure, it’s lovely when others have nice things to say, but I think there’s tremendous value in girls having a positive self-perception and inner voice in a society that has a tendency to focus so often on the outside rather than the person within. It also gives a tween girl who may not wish to talk about how she’s feeling the opportunity to find tactics and support on her own. There are times when children don’t want to talk about their problems with their parents and Girl Wise can empower them to work out a solution on their own, through words that encourage positive self-talk and self-esteem alongside ideas for challenging situations. Girl Wise is aimed at the 7-12 year old tween girl and the layout and language is designed for this group well. The books are displayed with a casual typeface and use language that feels as if it’s another person in the room talking with them. It’s personal and friendly, and combined with the whimsical drawings throughout, it feels like you’re having a chat with a dear friend. The books each feature stories from other girls, activities to complete, questions to challenge how the girls think and quotes that will inspire. “A guide to being YOU!” had numerous references to God and more biblical quotes, however those who aren’t religious would still appreciate the kindness and support of the words and activities. If you’d like to take a peek inside these books, you can view inside Girl Wise – A guide to being YOU! here and Girl Wise – A girl’s guide to FRIENDS! here. Girl Wise – A guide to being YOU! Girl Wise – A girl’s guide to FRIENDS! tiny & little makes every effort to undertake reviews fairly and transparently. The views expressed in this review are the personal views of the reviewer and this review was not sponsored or paid for in any way, however we received a copy of these books for review purposes.